Everyone already knows there are privacy issues related to social media and new technologies. Non-tech-oriented friends and family members often ask me questions about whether they should avoid Facebook messenger or flashlight apps. Or whether it's OK to use credit cards online in spite of recent breach headlines. The mainstream media writes articles about leaked personal photos and the Snappening. So, it's out there. We all know. We know there are bad people out there who will attempt to hack their way into our personal data. But, that's only a small part of the story. For those who haven't quite realized it, there's no such thing as a free service. Businesses exist to generate returns on investment capital. Some have said about Social Media, "if you can't tell what the product is, it's probably you." To be fair, most of us are aware that Facebook and Twitter will monetize via advertising of some kind. And yes, it may be personalized based on what we like or retweet. But, I'm not sure we fully understand the extent to which this personal, potentially sensitive, information is being productized. I recently viewed a product marketing video targeted to communications service providers. It describes that massive adoption of mobile devices and broadband connections suggesting that by next year there will be 7.7 billion mobile phones in use with 15 billion connections globally. And that "All of these systems produce an amazing amount of customer data" to the tune of 40TB per day; only 3% of which is transformed into revenue. The rest isn't monetized. (Gasp!) The pitch is that by better profiling customers, telcos can improve their ability to monetize that data. The thing that struck me was the extent of the profiling. 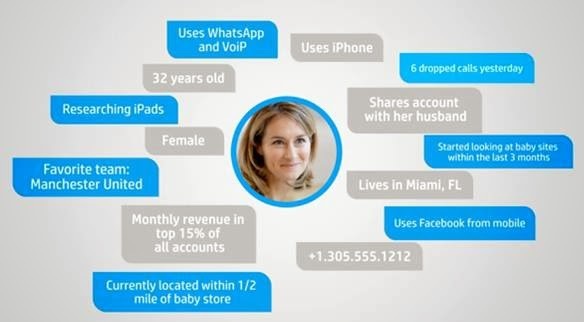 As seen in the screen capture, the user profile presented extends beyond the telco services acquired or service usage patterns into the detailed information that flows through the system. The telco builds a very personal profile using information such as favorite sports teams, life events, contacts, location, favorite apps, etc. And we should assume that favorite sports team could easily be religious beliefs, political affiliations, or sexual interests. On October 29, IBM and Twitter announced a new relationship that enables enterprises to "incorporate Twitter data into their decision-making." In the announcement, Twitter describes itself as "an enormous public archive of human thought that captures the ideas, opinions and debates taking place around the world on almost any topic at any moment in time." And now all of those thoughts, ideas, and opinions are available for purchase through a partnership with IBM. I recently opened Facebook to see an updated list of People I may know. Most Facebook users are familiar with the feature. It can be an easy way to locate old friends or people who recently joined the network. But something was different. The list was heavily comprised of people who I sort of recognize but have never known personally. I realized that Facebook was trying to connect me with many of the people behind the accounts I follow on Instagram. Many of these people don't use their real names, talk about their work, or discuss personal family matters on Instagram. They're photographers sharing photos. Essentially, they're artists sharing their art with anyone who wants to take a look. And it feels like a safe way to share. But now I'm looking at a profile of someone I knew previously only as "Ty_Chi the landscape photographer" and I can now see that he is actually Tyson Kendrick, retail manager from Chicago, father of three girls and a boy. Facebook is telling me more than Mr. Kendrick wanted to share. And I'm looking at Richard Thompson, who's a marketing specialist for one of the brands I follow. I guess Facebook knows the real people behind brand accounts too. It started feeling pretty creepy. Monetization of social media goes way beyond targeted advertising. Businesses are reaching deep into any available data to make connections or discover insights that produce better returns. Service providers and social media platforms may share customer details with each other or with third parties to improve their own bottom lines. And the more creative they get, the more our sense of privacy erodes. What I've outlined here extends only slightly beyond what I think most people expect. But, we should collectively consider how far this will all go. If companies will make major financial decisions based on Twitter user activity, will there be well-funded campaigns to change user behavior on Social Media platforms? Will the free-flow exchange of ideas and opinions become more heavily and intentionally influenced? The sharing/exchanging of users' personal data is becoming institutionalized. It's not a corner case of hackers breaking in. It's a systemic business practice that will grow, evolve, and expand. I have no recipe to avoid what's coming. I have no suggestions for users looking to hold onto to the last threads of their privacy. I just think it's worth thinking critically about how our data may be used and what that may mean for us in years to come. Today, I posted a blog entry to the Oracle Identity Management blog titled Analyzing How MDM and MAM Stack Up Against Your Mobile Security Requirements. In the post, I walk through a quick history of mobile security starting with MDM, evolving into MAM, and providing a glimpse into the next generation of mobile security where access is managed and governed along with everything else in the enterprise. It should be no surprise that's where we're heading but as always I welcome your feedback if you disagree. Mobile is the new black. Every major analyst group seems to have a different phrase for it but we all know that workforces are increasingly mobile and BYOD (Bring Your Own Device) is quickly spreading as the new standard. As the mobile access landscape changes and organizations continue to lose more and more control over how and where information is used, there is also a seismic shift taking place in the underlying mobile security models. Mobile Device Management (MDM) was a great first response by an Information Security industry caught on its heels by the overwhelming speed of mobile device adoption. Emerging at a time when organizations were purchasing and distributing devices to employees, MDM provided a mechanism to manage those devices, ensure that rogue devices weren’t being introduced onto the network, and enforce security policies on those devices. But MDM was as intrusive to end-users as it was effective for enterprises. One of the first things to catch my eye this week at RSA was a press release by STEALTHbits on their latest Data Governance release. They're a long time player in DG and as a former employee, I know them fairly well. And where they're taking DG is pretty interesting. The company has recently merged its enterprise Data (files/folders) Access Governance technology with its DLP-like ability to locate sensitive information. The combined solution enables you to locate servers, identify file shares, assess share and folder permissions, lock down access, review file content to identify sensitive information, monitor activity to look for suspicious activity, and provide an audit trail of access to high-risk content. The STEALTHbits solution is pragmatic because you can tune where it looks, how deep it crawls, where you want content scanning, where you want monitoring, etc. I believe the solution is unique in the market and a number of IAM vendors agree having chosen STEALTHbits as a partner of choice for gathering Data Governance information into their Enterprise Access Governance solutions. Learn more at the STEALTHbits website. I'm at the RSA Conference this week. I considered the point of view that perhaps there's something to be said for abstaining this year but ultimately my decision to maintain course was based on two premises: (1) RSA didn't know the NSA had a backdoor when they made the arrangement and (2) The conference division doesn't have much to do with RSA's software group. Anyway, my plan is to take notes and blog or tweet about what I see. Of course, I'll primarily be looking at Identity and Access technologies, which is only a subset of Information Security. And I'll be looking for two things: Innovation and Uniqueness. If your company has a claim on either of those in IAM solutions, please try to catch my attention. As more people are using the phrase "third platform", I'll assume it needs no introduction or explanation. The mobile workforce has been mobile for a few years now. And most organizations have moved critical services to cloud-based offerings. It's not a prediction, it's here. The two big components of the third platform are mobile and cloud. I'll talk about both. A few months back, I posed the question "Is MAM Identity and Access Management's next big thing?" and since I did, it's become clear to me that the answer is a resounding YES! Today, I came across a blog entry explaining why Android devices are a security nightmare for companies. The pain is easy to see. OS Updates and Security Patches are slow to arrive and user behavior is, well... questionable. So organizations should be concerned about how their data and applications are being accessed across this sea of devices and applications. As we know, locking down the data is not an option. In the extended enterprise, people need access to data from wherever they are on whatever device they're using. So, the challenge is to control the flow of information and restrict it to proper use. So, here's a question: is MDM the right approach to controlling access for mobile users? Do you really want to stand up a new technology silo that manages end-user devices? Is that even practical? I think certain technologies live a short life because they quickly get passed over by something new and better (think electric typewriters). MDM is one of those. Although it's still fairly new and good at what it does, I would make the claim that MDM is antiquated technology. In a BYOD world, people don't want to turn control of their devices over to their employers. The age of enterprises controlling devices went out the window with Blackberry's market share. Containerization is where it's at. With App Containerization, organizations create a secure virtual workspace on mobile devices that enables corporate-approved apps to access, use, edit, and share corporate data while protecting that data from escape to unapproved apps, personal email, OS malware, and other on-device leakage points. For enterprise use-case scenarios, this just makes more sense than MDM. And many of the top MDM vendors have validated the approach by announcing MAM offerings. Still, these solutions maintain a technology silo specific to remote access which doesn't make much sense to me. As an alternate approach, let's build MAM capabilities directly into the existing Access Management platform. Access Management for the third platform must accommodate for mobile device use-cases. There's no reason to have to manage mobile device access differently than desktop access. It's the same applications, the same data, and the same business policies. User provisioning workflows should accommodate for provisioning mobile apps and data rights just like they've been extended to provision Privileged Account rights. You don't want or need separate silos. The same can be said, for cloud-hosted apps. Cloud apps are simply part of the extended enterprise and should also be managed via the enterprise Access Management platform. I guess if I had to boil this down, I'm really just trying to dispel the myths about mobile and cloud solutions. When you get past the marketing jargon, we're still talking about Access Management and Identity Governance. Some of the new technologies are pretty cool (containerization solves some interesting, complex problems related to BYOD). But in the end, I'd want to manage enterprise access in one place with one platform. One Identity, One Platform. I wouldn't stand up a IDaaS solution just to have SSO to cloud apps. And I wouldn't want to introduce an MDM vendor to control access from mobile devices. The third platform simply extends the enterprise beyond the firewall. The concept isn't new and the technologies are mostly the same. As more and newer services adopt common protocols, it gets even easier to support increasingly complex use-cases. An API Gateway, for example, allows a mobile app to access legacy mainframe data over REST protocols. And modern Web Access Management (WAM) solutions perform device fingerprinting to increase assurance and reduce risk while delivering an SSO experience. Mobile Security SDKs enable organizations to build their own apps with native security that's integrated with the enterprise WAM solution (this is especially valuable for consumer-facing apps). And all of this should be delivered on a single platform for Enterprise Access Management. That's third-platform IAM.